New MIT-NASA research using models of Atlantic circulation finds that the ocean absorbs atmospheric gases more easily than heat energy, and the slowing circulation that results, reduces its ability to absorb both. The world’s oceans are like brakes slowing down the full effects of greenhouse gas warming of the atmosphere. Over the last ten years, one-fourth of human-emissions of carbon dioxide as well as 90 percent of additional warming due to the greenhouse effect have been absorbed by the oceans. Acting like a massive sponge, the oceans pull from the atmosphere heat, carbon dioxide and other gases, such as chlorofluorocarbons, oxygen and nitrogen and store them in their depths for decades to centuries and millennia. New MIT-NASA research is one of the first studies to estimate how much and how quickly the ocean absorbs atmospheric gases and contrasts it with the efficiency of heat absorption. Using two computer models that simulate the ocean, MIT and NASA scientists found that gases are more easily absorbed over time than heat energy. In addition, they found that in scenarios where the ocean current slows down due to the addition of heat, the ocean absorbs less of both atmospheric gases and heat, though its ability to absorb heat is more greatly reduced. The results were published in Geophysical Research Letters, a journal of the American Geophysical Union. “As the ocean slows down, it will keep uptaking gases like carbon dioxide more efficiently, much more than it will keep uptaking heat. It will have a different behavior for chemistry than it has for temperature,” said Anastasia Romanou, lead author and climate scientist at NASA’s Goddard Institute for Space Studies and Columbia University in New York City. The oceans play a significant role in absorbing greenhouse gases, like carbon dioxide, and heat from the atmosphere. This absorption can help mitigate the early effects of human-emissions of carbon dioxide. The Atlantic Meridional Overturning Circulation acts as a conveyor belt of ocean water from Florida to Greenland. Along the journey north, water near the surface absorbs greenhouse gases, which sink down as the water cools near Greenland. In this way, the ocean effectively buries the gases deep below the surface. Credit: NASA's Goddard Space Flight Center/ Kathryn Mersmann | Music: Anywhere by François Pavan [SACEM], Mi-Yung Pavan [SACEM]. 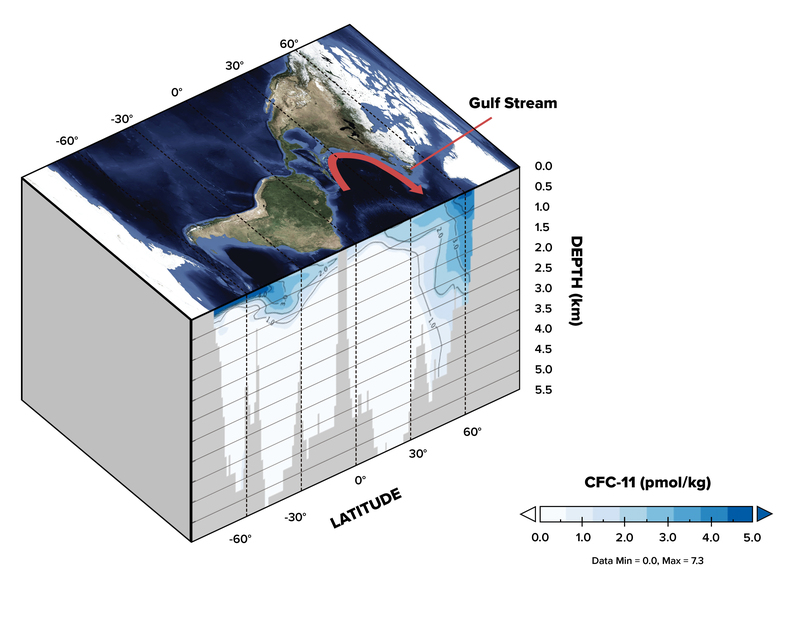 She and colleagues at the Massachusetts Institute of Technology in Cambridge, Massachusetts used the NASA GISS ocean model and the MIT General Circulation Model to simulate one of the Atlantic’s major current systems that delivers absorbed heat and gases to the depths. In the Atlantic Ocean, the Gulf Stream is part of what’s called the Atlantic Meridional Overturning Circulation, a conveyor belt of ocean water that carries warm water from Florida to Greenland where it cools and sinks to 1,000 meters or more before traveling back down the coast to the tropics. On its northward journey, the water at the surface absorbs gases like carbon dioxide and chlorofluorocarbons (CFCs) – the latter are, to a large extent, the gases responsible for the ozone hole over Antarctica – as well as excess heat from the atmosphere. When it sinks near Greenland, those dissolved gases and heat energy are effectively buried in the ocean for years to decades and longer. Removed from the atmosphere by the ocean, the impact of their warming on the climate has been dramatically reduced. To understand and quantify the ocean’s sponge-like capabilities, the researchers used the two independent models of Atlantic Ocean currents together with shipboard observations of chlorofluorocarbons as a starting point. Chlorofluorocarbons are what’s called a passive tracer. In the real world as well as in the model, this allows scientists to “see” how much of the gas is absorbed from the atmosphere into the ocean and then follow it as it travels around the world in the currents. Adding heat to the ocean, in contrast, slows down the overturning circulation because ocean currents depend on temperature gradients – moving from warmer locations to cooler locations – that weaken under global warming as cooler waters heat up. This means that estimating how much heat the ocean absorbs by only using a tracer may not be accurate. “The results show that we need to think differently about how the ocean responds to taking up heat and passive tracers or greenhouse gases. Then we need to study them in parallel but using different methods,” Romanou said. These results from the computer models of the Atlantic Meridional Overturning Circulation are one of the many moving parts that come together in global climate models. By refining scientists’ understanding of how efficiently gases and heat are taken up, the finding will improve global climate model projections for future climate scenarios, said Marshall. This is especially true for projections that stretch tens or a hundred years into the future, when those tracers and other gases that behave similarly like carbon dioxide, as well as excess heat energy, reach the upward turn of the conveyor belt and return to the surface. When that happens some portion of them will return to the atmosphere after their long underwater journey around the planet. This eventual release of buried gases and heat from the oceans is sometimes called the “warming in the pipeline” or “warming commitment” that people will eventually have to contend with, Romanou said. John Marshall is an oceanographer interested in climate and the general circulation of the atmosphere and oceans, which he studies through the development of mathematical and numerical models of key processes. 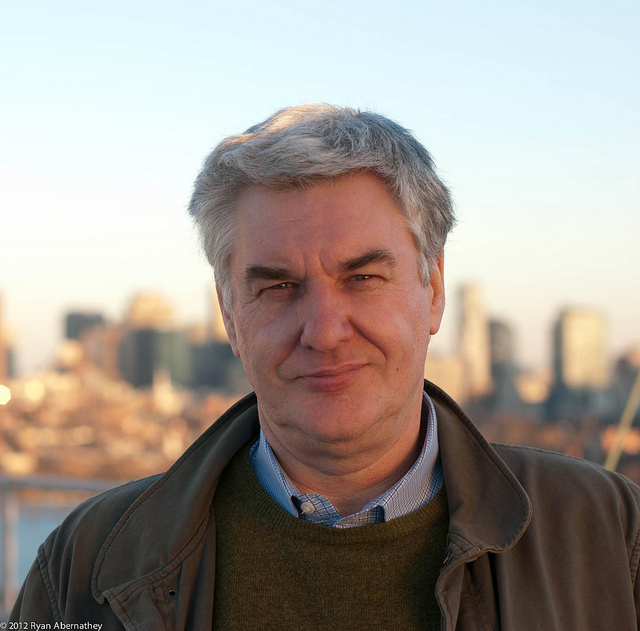 His research has focused on problems of ocean circulation and coupled climate dynamics involving interactions between motions on different scales, using theory, laboratory experiments, observations and new innovative approaches to global ocean modeling pioneered by his group at MIT.